In the southwest region of France, in the Lot departement, is the tiny village of Rocamadour. Hugging the cliffside of a mountain, the setting of this medieval village looks dramatic. If you could airbrush out the tourists, Rocamadour seems to be untouched by time. Its main thoroughfare is still the one narrow paved street which is lined with medieval houses. But time hasn’t really stood still for Rocamadour. This village, with a population of 650, hosts an annual Fête des Fromages which is the largest cheese festival in the south of France. It is attended by some 10,000 visitors and according to 2010 statistics, 2 tons of cheese were sold and 1,200 meals served. The Fête des Fromages is usually held around Pentecost Sunday and forty producers from the South of France’s 15 regions bring their cheeses to the Fête. Rocamadour itself has a soft goat cheese named after it – Cabécou de Rocamadour. 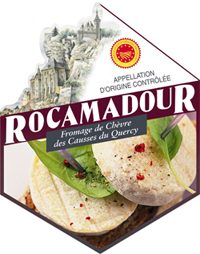 Since being awarded the AOC label in 1996, the producers have abandoned the Cabécou part of the name as it is too generic and hence today the cheese is just called “Rocamadour”. This also enables them to differentiate “Rocamadour” from the many other Cabécou (a soft goat cheese) that exist. The Fête des Fromages usually kicks off with a Mass (messe des “Fruits de la Terre”) and then there’s a blessing of the sheep and goat herds. A cheese competition is one of the main events as well as lunch. There’s a farmers market where visitors can partake in wine and cheese tasting and buy cheeses – and it seems that lots of people do. There’s also music and entertainment throughout the day to keep the festival spirit. If you’re holidaying in the South of France around Pentecost, it is really worthwhile making a stop at Rocamadour. Apart from the opportunity to taste Rocamadour cabécou and the other famous cheeses from the region, there is a lot to see in this village which was once a famous pilgrimage centre. Around the shops in the village, you’d also be able to buy some of the specialties from the south of France which include fois gras, pâtés truffés (truffle pâté), confits et magrets of duck and goose, Roquefort cheese and lamb.